Learn about the importance of mighty micronutrients—and the common dietary pitfalls that may mean you're missing out. With the growing popularity of flexible dieting among the fitness community, macronutrients—or "macros"—have become a hot topic. Yet "micronutrients" seems to be a forgotten word. In fact, even fitness enthusiasts often have no clue as to whether they're getting adequate amounts of vitamins, minerals, and essential fatty acids. We know from the National Health and Nutrition Examination Survey (NHANES) that more than 50 percent of adults in the United States are lacking in at least five essential micronutrients—vitamins D, E, and A, omega-3 fatty acids, and magnesium. Here's a rundown of the most often overlooked micronutrients, why they're essential, how to recognize a deficiency, and the best food sources to lean on to make sure you're getting a full dose. Vitamin D is the biggest problem, with 93 percent of U.S. adults 19 years or older getting less than the estimated average requirement (EAR) set by the Institute of Medicine. Why it's essential: This fat-soluble vitamin helps your body absorb calcium, an important mineral that helps keep your bones strong and healthy, while also activating various neuromuscular and immune functions and reducing inflammation. Vitamin D may even be helpful for maintaining a healthy body weight. Deficiency symptoms: Inadequate vitamin D intake is typically indicated by bone pain and muscle weakness, but other possible symptoms include depression and ongoing gastrointestinal issues. Food sources: The few foods that contain vitamin D include fatty fish, beef liver, cheese, egg yolk, and fortified foods (breakfast cereals, some brands of milk, nondairy milk, orange juice, and yogurt). Direct sunlight also activates vitamin-D synthesis in skin, but people with darker complexions and those who live in the northern latitudes typically do not produce enough. The few foods that contain vitamin d include fatty fish, beef liver, cheese, egg yolk, and fortified foods (breakfast cereals, some brands of milk, nondairy milk, orange juice, and yogurt). Recommendation: Since few foods contain vitamin D, I recommend supplementing with vitamin D in the range of 2,000-4,000 IU to ensure adequate levels. I also recommend getting at least 15 percent of your total calories from fat to enable absorption of fat-soluble vitamins like vitamin D.
Vitamin E comes in a close second for micronutrient deficiencies, with 90 percent of U.S. adults falling short of the estimated average requirement (EAR). Why it's essential: Vitamin E is a fat-soluble vitamin that exists in eight chemical forms, with alpha-tocopherol being the most biologically active. This potent antioxidant is involved in cell signaling, gene expression, immune function, and muscle repair. Vitamin E is also necessary for the production of prostaglandins, hormone-like substances that regulate everything from blood pressure to muscle contraction. Deficiency symptoms: Clinically diagnosed vitamin-E deficiency is rare and results in muscle weakness, loss of muscle mass, abnormal eye movements, vision problems, and eventually, liver, and kidney problems. However, low levels of vitamin E are extremely common and can cause gastrointestinal distress, hair loss, muscle weakness, slow healing, and leg cramps. Food sources: Unlike vitamin D, plenty of foods provide vitamin E. Nuts, seeds, and vegetable oils are among the best sources of alpha-tocopherol, and significant amounts are available in green leafy vegetables and fortified cereals. Nuts, seeds, and vegetable oils are among the best sources of alpha-tocopherol, and significant amounts are available in green leafy vegetables and fortified cereals. Recommendation: Make sure you're getting at least 15 percent of your total calories from fats, and emphasize nuts, nut butters, seeds, and vegetable oils (like coconut and canola) as part of your daily diet. Why it's essential: Omega-3s are considered essential fatty acids because the body cannot synthesize them without dietary sources. These fatty acids are an integral part of cell membranes and help regulate blood lipids, clotting, and vasodilation. Omega-3 fatty acids are highly concentrated in the brain and effect cognitive and behavioral function. Omega-3s also play a role in body composition. As part of cell membranes, omega-3 fatty acids may improve insulin sensitivity, helping the body to use carbohydrates more efficiently for energy and building muscle. Interestingly, eight weeks of omega-3 supplementation (4 grams per day) has been shown to increase lean mass by reducing cortisol and enhancing protein synthesis (muscle growth) by up to 30 percent via the mTOR pathway. Deficiency symptoms: Omega-3 deficiency can cause fatigue, poor memory, dry skin, heart problems, mood swings or depression, and poor circulation. However, not everyone who is low in omega-3 will notice these symptoms. Food sources: There are three main forms of omega-3: DHA (docosahexaenoic acid), EPA (eicosapentaenoic acid), and ALA (alpha-linolenic acid). DHA and EPA are found in marine sources like salmon, cod, mackerel, tuna, algae, and seaweed; as well as free-range eggs and chickens, and grass-fed beef. The third form, ALA, is found in dark-green leafy vegetables, flax seeds, hemp seeds, walnuts, and vegetable oils such as avocado, canola, flaxseed, peanut and olive oil. DHA and EPA are considered more beneficial than ALA, since ALA must first be converted into one of the other two forms. DHA and EPA are found in marine sources like salmon, cod, mackerel, tuna, algae, and seaweed; as well as free-range eggs and chickens, and grass-fed beef. The third form, ala, is found in dark-green leafy vegetables, flax seeds, hemp seeds, walnuts, and vegetable oils such as avocado, canola, flaxseed, peanut and olive oil. Recommendation: Aim to get two servings of fatty fish per week, or supplement with 1,000 milligrams of high-quality fish oil containing at least 300 milligrams of DHA plus 200 milligrams of EPA. Vegans can use algae oil. Also, limit foods that are high in the inflammatory omega-6 oils, which are used extensively in processed foods and found in corn, soy, safflower, sunflower, and vegetable-oil blends. Magnesium comes in fourth place, with 54 percent of U.S. adults getting less than the Estimated Average Requirement (EAR). Why it's essential: Magnesium has an astonishingly diverse role. For one, there are over 300 magnesium-dependent enzymes in the body! These enzymes control everything from blood pressure and blood sugar levels to muscle and nerve function. Magnesium is also necessary for energy production (oxidative phosphorylation, glycolysis) and the synthesis of DNA, bone, and muscle. Muscle contraction, heart rhythm, and even nervous-system communications would not be possible without magnesium. Deficiency symptoms: Magnesium deficiency is typically indicated by a loss of appetite, nausea, vomiting, fatigue, and muscle weakness. However, prior to clinical deficiency, inadequate magnesium intake can contribute to anxiety, hyperactivity, difficulty sleeping, muscle spasms and cramping, and fibromyalgia. Some of the effects of aging (loss of muscle mass, increased blood pressure, and diminished nervous-system function) can be partially attributed to insufficient magnesium. 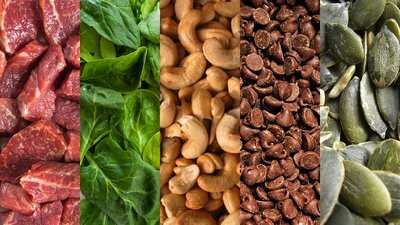 Food sources: Good food sources of magnesium include dark leafy greens (spinach, Swiss chard), nuts (almonds, cashews), seeds (sesame and sunflower), fish, tofu, beans, whole grains (oatmeal, quinoa), bananas, dried fruit, and dark chocolate (yum). Good food sources of magnesium include dark leafy greens (spinach, swiss chard), nuts (almonds, cashews), seeds (sesame and sunflower), fish, tofu, beans, whole grains (oatmeal, quinoa), bananas, dried fruit, and dark chocolate. Recommendation: Food sources of magnesium abound, so the key is minimizing things that can decrease magnesium levels, like sugary sodas, high stress levels, and the use of diuretics. For most people, I recommend a magnesium supplement (such as magnesium citrate) at 200-300 milligrams per day. Epsom salts and magnesium-oil sprays can also be used externally. Finally, inadequate vitamin-A intake is a concern, with 45 percent of U.S. adults getting less than the Estimated Average Requirement (EAR). Why it's essential: Vitamin A is a fat-soluble vitamin that supports vision, immune function, reproduction, and fetal development. Vitamin A also plays a critical role in the maintenance and functionality of the heart, lungs, kidneys, and other organs. Deficiency symptoms: Inadequate vitamin-A intake can contribute to night blindness, double vision, skin irritation and dry skin, headaches, dizziness, nausea, muscle and joint pain, and loss of balance. Food sources: Foods high in vitamin A include organ meats, salmon and other fatty fish, green leafy vegetables, orange and yellow fruits and vegetables (peppers, carrots, squash, cantaloupe, apricots, mango), dairy products, and fortified cereals. Foods high in vitamin A include organ meats, salmon and other fatty fish, green leafy vegetables, orange and yellow fruits and vegetables (peppers, carrots, squash, cantaloupe, apricots, mango), dairy products, and fortified cereals. Recommendation: Most people do not need a vitamin A supplement; they just need to eat more fruits and vegetables! Taking megadoses of vitamin A in supplement form can be harmful, so it's best to focus on dietary sources. This may seem like a lot of information, but completely ignoring micronutrients is not wise! Doing so can have detrimental long-term consequences, and from an aesthetic perspective, hinder fat loss and muscle growth. The first and most important step is choosing a variety of whole foods as the foundation of your diet. Add a multivitamin, fish oil, vitamin D, and a magnesium supplement to that, and you'll be on the right track to whole-body fitness and wellness for life. Dietary Guidelines for Americans 2015-2020 8th Edition. (n.d.). Retrieved from http://health.gov/dietaryguidelines/2015/guidelines/. Fulgoni, V. L., Keast, D. R., Bailey, R. L., & Dwyer, J. (2011). Foods, fortificants, and supplements: where do Americans get their nutrients? The Journal of Nutrition, 141(10), 1847-1854. Papanikolaou, Y., Brooks, J., Reider, C., & Fulgoni, V. L. (2014). US adults are not meeting recommended levels for fish and omega-3 fatty acid intake: results of an analysis using observational data from NHANES 2003-2008. Nutrition Journal, 13(1), 1. DGAC Meeting Summary, January 28-29, 2004. (n.d.). Retrieved from http://health.gov/dietaryguidelines/dga2005/minutes0128292004.htm. Office of Dietary Supplements - Vitamin A. (n.d.). Retrieved from https://ods.od.nih.gov/factsheets/VitaminA-HealthProfessional/.